We are pleased to announce that we can now supply the range of Tanabe exhaust and suspension products. Veterans of the aftermarket components industry, Tanabe have been making cars faster and more fun to drive since 1982. They have adapted to changing economic conditions with confidence and the drive to thrive. As aftermarket parts have become more mainstream and appealing to the public, Tanabe have reacted accordingly, diversifying their brand to appeal to enthusiasts of all kinds. Have a browse through our selection of Tanabe products. Tanabe offer two styles with several variants to ensure that every driver and many different cars are catered for. The Concept G Exhausts offer high power benefits, whilst maintaining responsible sound levels, whereas the Medalion Touring Exhaust offers a deeper exhaust note. 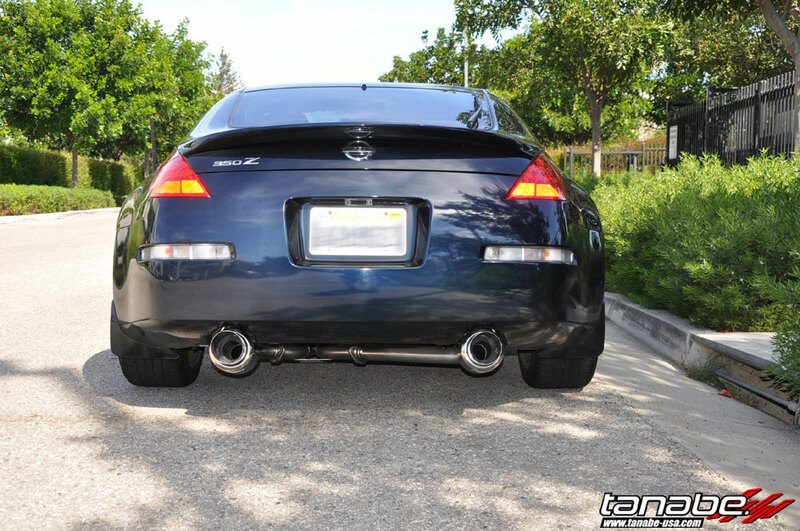 All Tanabe exhaust are made from stainless steel and developed with weight reduction in mind, this is achieved through the use of hollow exhaust hangers and pressed flanges, this is also done by using 1.2mm piping, saving weight while remaining durable. Tanabe also offer a range of suspension and chassis products. Tower bars, under braces and sway bars increase the rigidity of the chassis, eliminating almost all flex, and the sway bars reduce body roll, thus improving handling and the stability of the vehicle. Tanabe's NF210 Springs offer a tasteful drop and feature approx. 5% increase in spring rates, this means that factory ride quality is still retained, while gaining a drop in ride height. The DF210 Springs offer a large drop (2.5" in some applications) for those who dislike wheel arch gap and ride quality is still retained with an increase in spring rates to compensate for the shorter suspension travel. The GF210 offers a subtle drop in ride height with high spring rates (20-30% increase) to offer maximum performance. Tanabe haven’t lasted over 30 years in this industry by cutting corners, and their strict production standards mean that your suspension and exhaust systems are built to last. Their long and storied involvement in motorsports has given them experience of the toughest driving conditions - they know that their parts have to withstand and thrive in these conditions. The Tanabe parts you buy are made out of high-grade stainless steel and built to the highest quality and safety standards. Tanabe parts are designed to be lighter than stock systems, so your car will fly along with less bulk. All exhaust components are built to comply with emissions standards, so you can install them with no worries. Suspension systems are designed with adjustability at the core, so you can change your system to match the driving you're going to be doing. A range of suspensions systems vary in suitability for different driving conditions, but all are adjustable. Tanabe is partnered with Kayabe Industry Company, one of the leading manufacturers of performance dampeners, this means that Tanabe suspension systems benefit from this expertise and technology. Get in touch with the team at Tarmac Sportz if you have any questions about our range of Tanabe products, we’re always up for a chat.